Make the most of Madrid’s legendary nightlife on this 4-hour bar crawl. With a local guide, visit some of the city’s hottest spots and discover what life is like in the Spanish capital after the sun sets. Rub shoulders with the locals and your fellow partygoers at three popular bars in the buzzing Huertas neighborhood. Down a complimentary shot in each venue, as well as a beer or glass of sangria in the first bar. Finish up with VIP admission to one of the city’s happening clubs. Salut! In Pedro Almodóvar's film The Flower of My Secret, Marisa Paredes' estranged husband rings her from Brussels, asking if it's too late to call. She wistfully replies, 'In Madrid it's never late.' While the whole of Spain is known for its late-night life, Madrid takes it to the extreme, with the city only truly coming to life long after darkness falls. Meet your local guide and fellow partygoers in central Madrid, and then make your way to the first venue of the bar crawl. Kick off the night at a popular cocktail bar, where you’ll enjoy a complimentary beer or sangria and a shot of tequila. 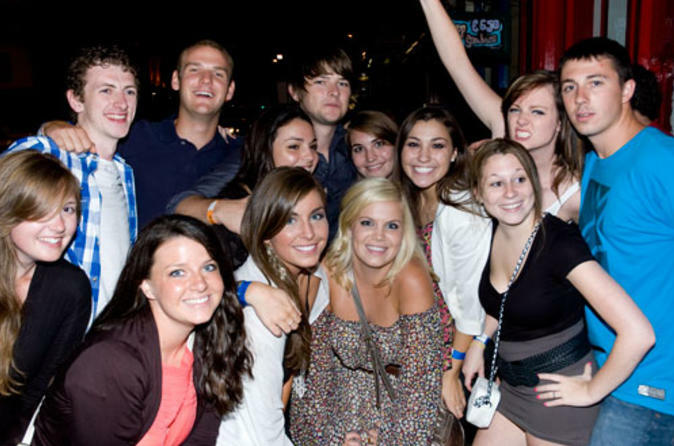 Chat with your friends and group, and soak up the buzzing atmosphere as you rub shoulders with locals. Then, visit two more bars in Huertas, the once-derelict neighborhood that has transformed itself into one of Europe's most vibrant party quarters. Down a complimentary shot of tequila in both venues and, should you wish, opt in to the ‘power hour’ to enjoy a full hour of unlimited beer or sangria (own expense). As the early hours of the morning approach, it’s time to hit the dance floor. Finish your drink at the last bar, and then follow your guide to one of the city’s hottest clubs. Skip past the lines and, once inside, you’re free to dance until the club closes — or as long as your stamina allows you. When you leave the club, make your own way back to your accommodation.